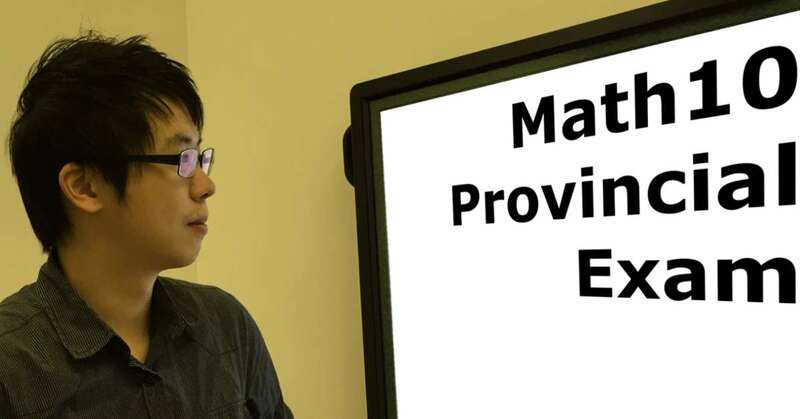 Did you know 1 out of every 6 students failed their math 10 provincial exam? No worries! Here’s a study guide on how you can get ready and a good grade in the exam. All students who are in grade 10 and live in British Columbia are all required to take the provincial exams. BC provincial exams actually take place in almost two months. About one third of the students only got a C- or even fail their math 10 provincial exam! (Better start studying for the exams early). Don’t memorize all the formulas and equations! You will be provided with data pages during the exam. You can check you marks on EdAccess with your Personal Education Number (PEN) on the Ministry of Education website. The mark from provincial exam is worth 20% of your Math 10 final mark. Students can rewrite the provincial exams only once after 12 months of writing it the first time. After the second attempt, the student needs to retake the course so that he/she can rewrite the exam again. If you have taken the exam more than one time, the Ministry of Education will only take whichever mark is higher. If you have questions about the mark, you can request a re-marking through your school office. measurement strategies, use instruments like rulers, calipers and measuring tape. Want to watch more? Check out the entire package of Math 10 provincial exam practice questions on YouTube. StudyPug – Unlimited online math help. Get yourself prepared for any math exams anytime and anywhere! Think you are ready for the provincial exams? Test yourself on these past BC Math10 provincial exam questions on the BC Ministry of Education website! Math 10 provincial exams take place in almost every two months. Look at the complete exam schedule, and plan ahead. The full version of Grade 10 Foundations of mathematics and Pre-calculus curriculum is available on the Ministry of Education British Columbia website. Going to school in Ontario instead? Go to our Study Guide for Grade 9 EQAO Assessment of Math (MPM1D) in Ontario for help. We have kept Alberta students in mind too! Those who are from Alberta, please check out our Study Guide for Grade 9 Math Achievement Test (PAT) in Alberta. Did Obama Do Well in High School?